Welcome home to Whitney Springs in Northeast Nampa, Idaho. The community boasts proximity to the popular Treasure Valley Marketplace featuring restaurants, shopping and Costco, with easy access to I-84. New homes are available with open ranch and two-story floor plans offering 1,215 to 3,118 Sq. Ft. and up to six bedrooms. Residents enjoy easy access to Desert Springs Elementary and Sage Valley Middle, both part of the Vallivue School District and just minutes away. Take a stroll on the private, neighborhood walking paths and see for yourself why Whitney Springs real estate is such a desirable place to call home. Find the perfect community with our complete guide to new Nampa subdivisions or browse all new homes in Nampa. Get the Nampa realty experts working for you! 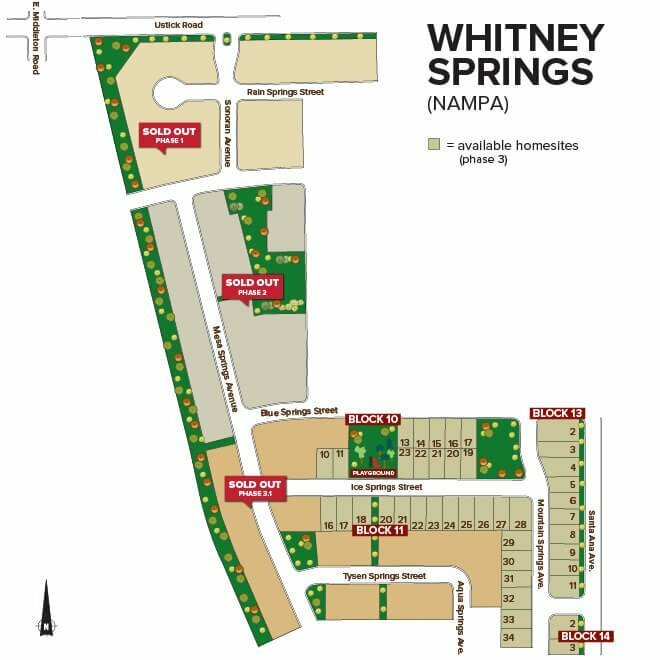 Contact us today to get the latest Whitney Springs real estate information. Location: Take the Midland Blvd exit North from I-84. Turn right (east) on Ustick Rd, then right (south) on Sonoran Ave.